Basant Panchami was celebrated with fervour on Dhalpur Maidan here today. A rath yatra was held after the idols of Lord Rama, Sita and Hanuman were brought in a beautifully decorated palanquin from the Raghunath temple and placed in the wooden chariot. Maheshwar Singh, the scion of the erstwhile royal family, who is also the “chharibardar” (chief caretaker) of Lord Raghunath, participated in the traditional yatra. The rath was pulled by hundreds of devotees from the northern end of Dhalpur Maidan to the temple in the middle of the maidan. Various rituals were performed in the temple. 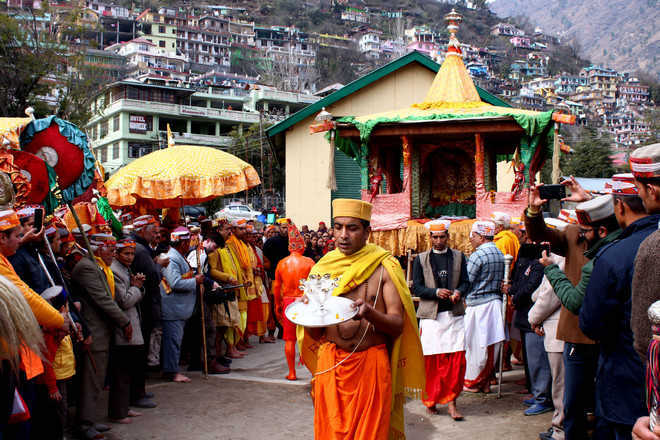 A large number of people witnessed the traditional yatra.